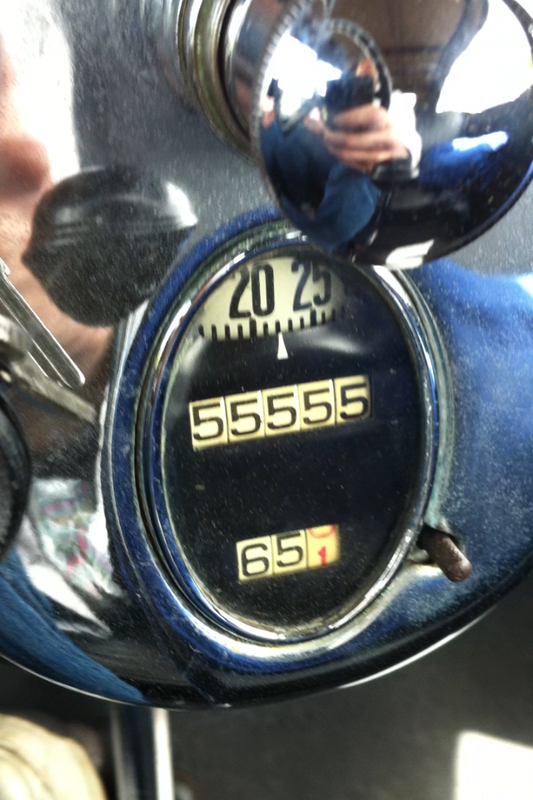 I can’t drive 55, but 55,555 has happened. The Phaeton’s systems need quite a bit of work before 55 MPH is a regularly achievable speed…. but who cares. In most situations, cruising around at the 45 to 50 MPH range is just fine. It is probably a meaningless achievement since the odometer didn’t work when I purchased the car; however, today the odometer reached 55,555. I thought that occasion merited a post. The achievement was made while leaving Autozone where I was picking up some armorall, rainex, and wax so the car shines on its up-and-coming road trip to Ithaca NY. John Explaining How Painting Lightning on The Car Will Make It Go Faster….. ok, that isn’t what he was really doing. This is John Karal leading a safety inspection on a NJRA Member’s Model A.
John Karal of Upper Saddle River was again kind enough to lead the North Jersey Regional Model A Club in conducting its annual Model A safety checks. This annual tradition for the club includes having several Model A experts with checklists on clipboards systematically look over members’ cars and test things ranging from headlights to steering. The checklist has nothing to do with “historic accuracy” or “how shiny is your paint”. The list hits safety and performance items only. John then gives you the “heads up” on things such as “your king pins haven’t gotten any worse since last year, but you may want to think about changing them next winter” or point blanks you with things like “you may want to tighten the wheel to the car before you go anywhere”. My car received the former comment and not the latter. Within 5 minutes of the latter comment being made, the wheel in question was off, the drum was pulled, and a collection of qualified experts diagnosed and proposed short and long term solutions. It was incredible to watch. There were no less than 6 people swarming about and people were taking turns going to their cars to grab “stuff”. “I have shims”, “I have a hub puller”, “Do you need a rear axle shaft key? I have three.” It was wild. 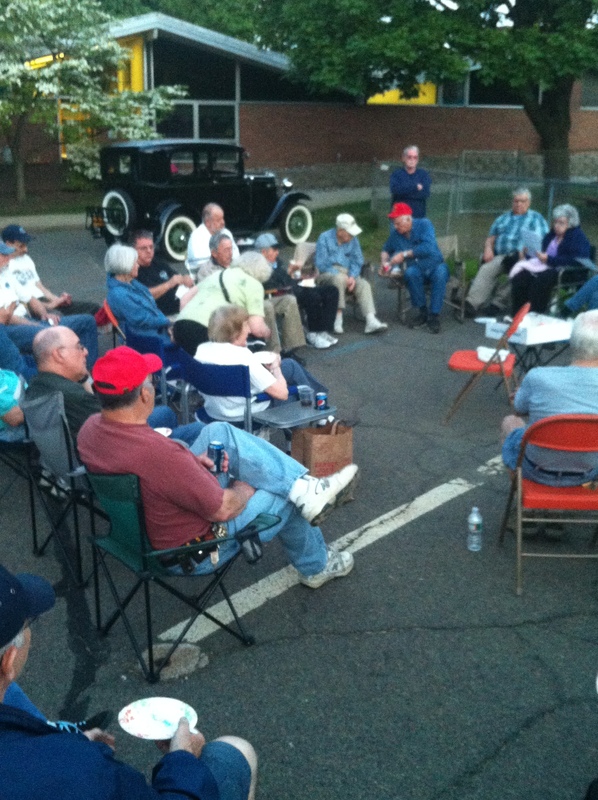 Here we are in a church parking lot at 7 PM on a Thursday and parts for an 84 year old car magically were appearing. The car owner was stepped though how to do the repair (which is a greasy one to do). Within 20 minutes the car was back together and ready to be safely operated. The teamworks and energy was amazing to watch. I wish I took photos of it to share. This is the third time John has looked over my car. It is “safe” but I again have a list from John of “watch this and do that” items. I’ll admit that I didn’t pass the entire list. My windshield wiper failed. This isn’t a surprise since it isn’t attached to the car. Last year I had it in my back seat. My rearview mirror also failed. It is loose and spins readily. I have to tighten a screw that holds it in place. John also has me keeping an eye on my 7-tooth steering box which is showing its age. This isn’t an immediate item and neither are the king pins I noted before. The car is safe for the pending trip to Ithaca. After the safety inspection the club congregated for hotdogs, its monthly meeting, and to sing happy birthday to two members (one in his mid-80s). The club has a few nice tours lined up for this year and has been asked to again participate in a collection of local parades. If you haven’t joined one of your local clubs yet, you should. Here is a link to the NJRA’s website. On the way home I did note that my headlights still “flicker” a little more than I like. I’ll have to keep an eye on this but suspect that I need to clean up the inside of the light switch/horn button. This shouldn’t be too difficult to do. One of the guys from my local club that has helped me out on repairs stopped by this evening. His headlights have been giving him problems. He knew that I had issues with mine and “futz” with them over and over again. This post is dedicated to Len. 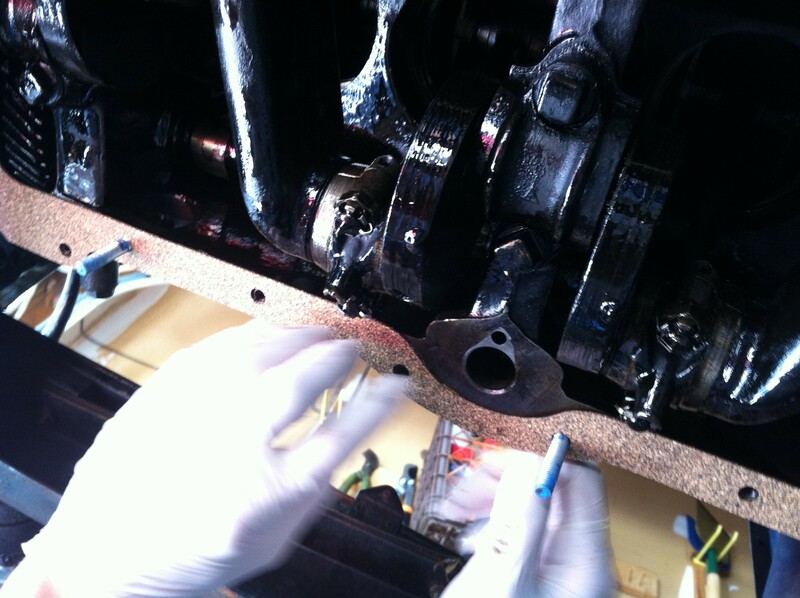 How does Seth fix the shorting out headlight problem with his Model A? By changing the connections from the historic 3-plunger/3-pin system to modern bullet connections. We are back on the road. A trusted engine rebuilder took a look at a bunch of my photos and suggested that I redo the sealant around the valve cover and not worry about the sealant around the oil pan (which isn’t nearly as excessive). So, with this advice in hand I decided to blend the information I received from all the experts and redo the valve chamber seal. This time I decided to use a light coat of the red super-tacky brush on sealant on the cover side only. The engine side has no sealant. It seems to have worked. It looks so much better than when I did it the first time. Here is a photos. With the cover “on”, I decided that I should focus on pre-lubing the system. As you may remember, I brushed oil on the inside components of the engine before I closed things up. I also used a plastic straw and dripped oil into some of the passageways. The engine rebuilder gave me some great advice to really make certain that the pre-lube worked correctly. He suggested that in addition to this painting of oil, I remove the distributor and pour 1 quart of oil down the shaftway and then full the balance of the needed oil into the normal oil-tube. This would ensure that all needed areas (the dipper-tray on top and the valve chamber) had oil. I was anxious about removing the distributor. 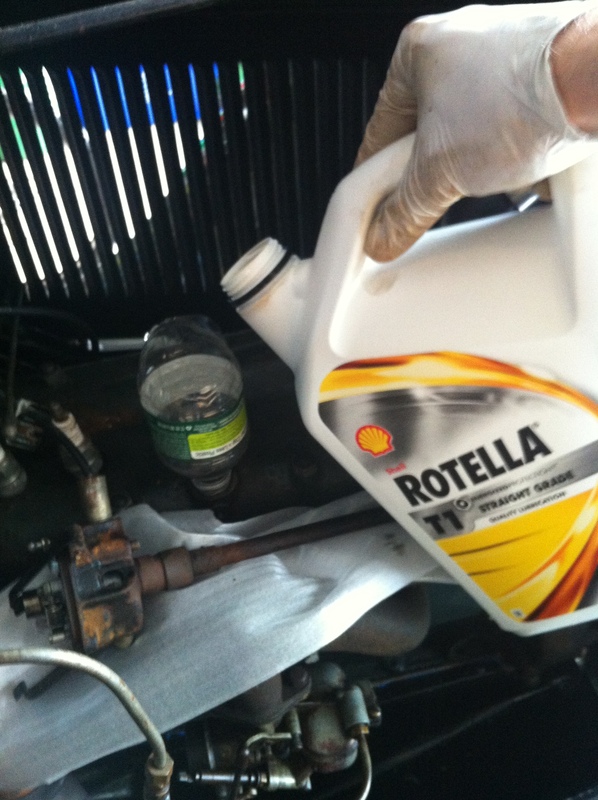 I helped Red do this when we changed head gaskets in CT last year when I was in route to Boston. It wasn’t easy. I’ve also read about many broken distributors and engine heads that resulted from removal of the distributor and had concern that you might need to reset the engine timing (as if I know how to do that). I spent about an hour researching the “how tos” and finally figured that I didn’t need to redo timing if I was careful. Here are some photos of my removing the distributor. It was “stuck”, but a few hits of PB Blaster helped. I am concerned about all that rust, but will not be dealing with it this month. From the images so far, do you see what I forgot? Ok, so know how I meticulously took care of the valve cover and removed the distributor. I carefully crafted a funnel to pour in oil to pre-lub. I basically over-thought and over analyzed every step and tried to be as precise and perfect as possible. Here is a video of my genius. Good thing I have a sense of humor and trays on the floor of the garage. Return tube installed, I tried filling the car with oil again. This time it seems to have stayed in the engine. After a nice snugging of the bolts and re-installation of the distributor I took the car off the stands and was back on the road. 3.5 weeks before the trip to Ithaca and I have a lot more work I would like to do. Before the big ride, I may do a smaller NYC trip. I will need to re-snug the oil pan and valve cover bolts but want to heat up and cool off the engine a few times. OK, so apparently the generous amount of silicon utilized in the gasket installation is a big “NO NO”. I’ve received recommendations from several model a engine experts that I should remove and reinstall the valve cover and probably the oil pan. They recommend that redo installing both with MUCH LESS (if not no) sealant. I may wind up ordering new gaskets tomorrow (you don’t reuse them and regardless, they are cheap). The good news is that it looks like I did all other things correctly. I guess I may have another chance to check the bearings clearance. The question now is about timing. I don’t know how much time I have to do all of this. Sunday was another busy day at the Kestenbaum homestead. At 8AM I was under the car scraping, cleaning and prepping. I am still a little disheartened that I didn’t get the rear main cap removed to check the oil passageway while this whole area was exposed. If it wasn’t for the time constraints this would have made a lot of sense to do. The “rope seal” was already in oil and a working table was set up with muffins, coffee, and juice. 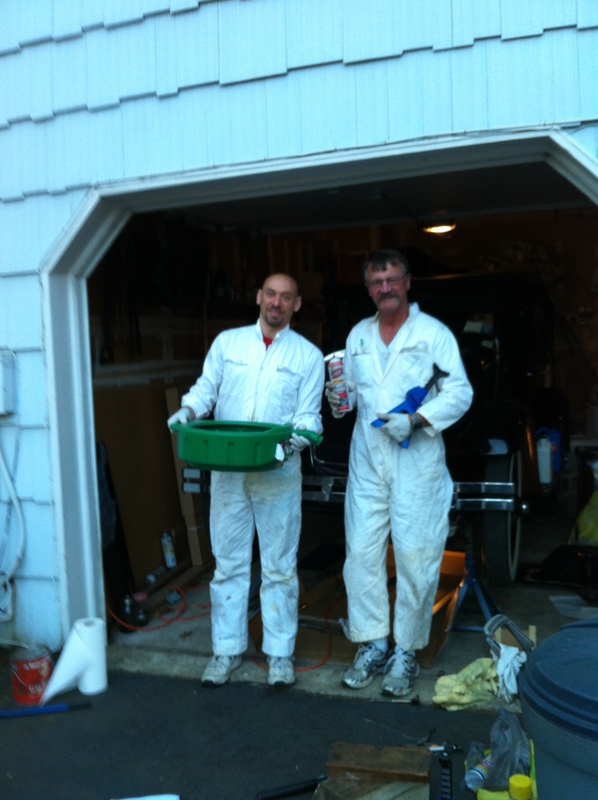 As noted last blog, Len Spinelli of the North Jersey Regional A was scheduled to come by to help me raise the oil pan. Raising the pan is not such a simple task and is definitely not a task you want to take on solo. Len has raised a couple of pans in his day. At 9AM he rolled in with his beautiful oil-leak-free-roadster, some guide bolts, permatex blue gasket sealant, some extra bolts, and a whole lot of knowledge. The first thing we did was figure out how to handle that spring that in most cars is attached to the bottom of the oil PUMP. 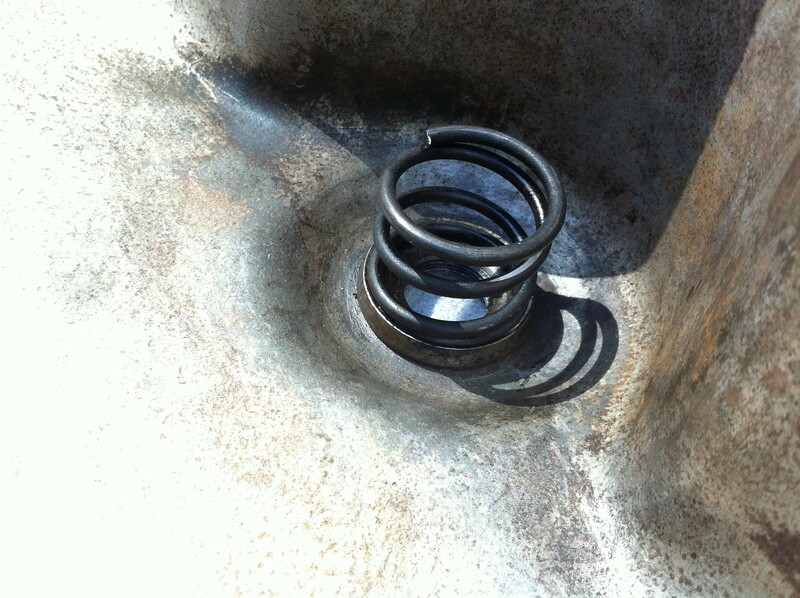 Apparently, in some early 1929s the spring sits in a cup in the oil PAN. These are rare but documented as factory correct. With a little persuasion the spring clicked into the cup and held fast. Here is a photo of the spring/pan setup. Second thing we did was address removing the oil pan hole screw. You remove this screw, put the oil pump into the underside of the engine, and then with a dowel can hold the pump in place and raise the pan. The screw is a special screw that costs $0.50 and that was stripped to the point where Len and I were almost ready to drill it out and call the day’s project un-doable. Before we gave up, we got as far as using a hack saw blade to try to cut a better channel into the screw. This was working, but the screw was still stuck. Thankfully, that neighbor Scott Hanson is the guru of all tools big and small. At 10:15 when Len and I were still fiddling about in trying to get the screw out, I went across to the Hanson House. Within 10 minutes Scott was over with a bunch of special tools. It took him all of 30 seconds to look at the task, reaching into a bag of stuff, break out a special tool and BLAMO — the screw was out. Scott decided to stick around and continue to impress us. The third task is the big one…. Raising the oil pan and putting it all back together. 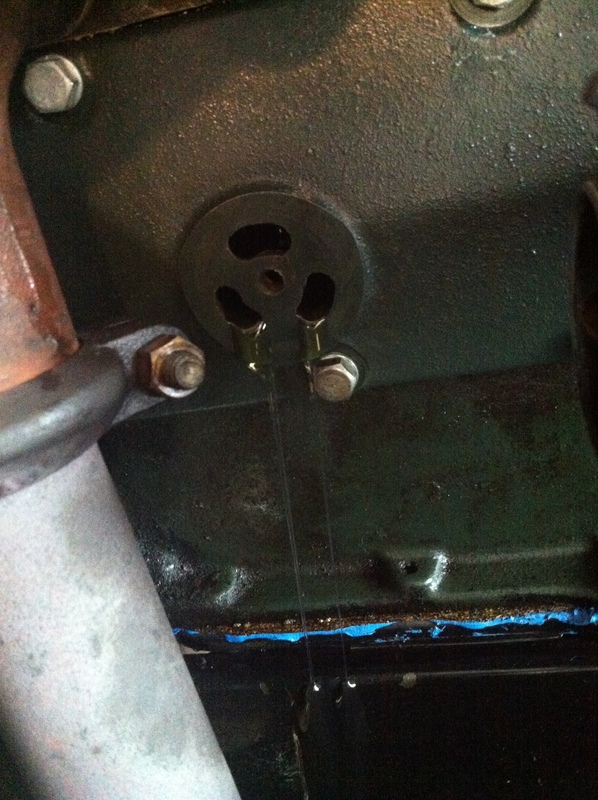 First a rubbed a bit of oil all over the crank and cam shaft and elsewhere in the chamber. We then took the oil soaked crack shaft rope packing and put it in place. 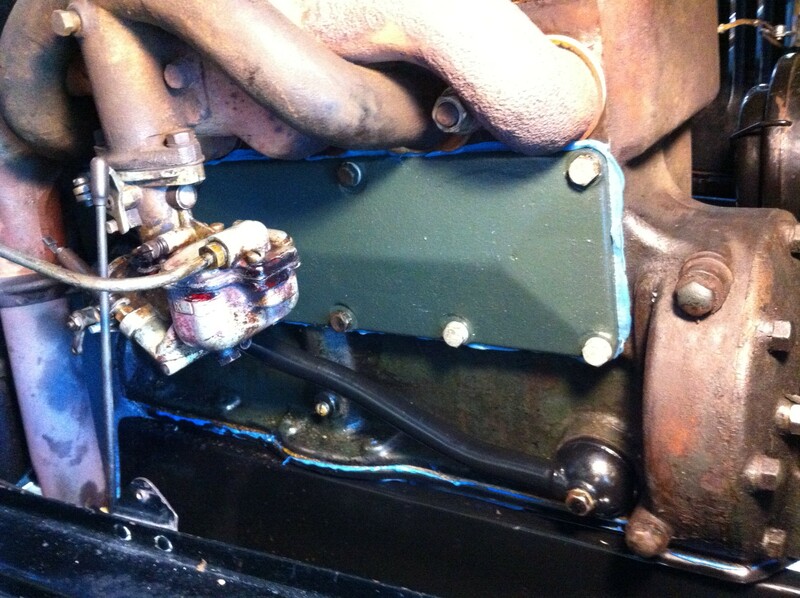 We added some gasket sealant to the underside of the engine where the oil pan goes. 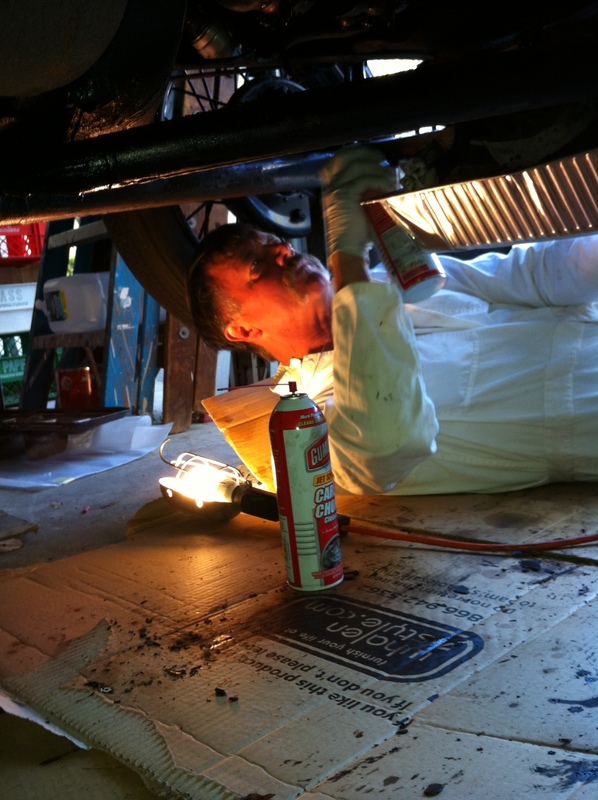 We carefully placed the gasket on the underside of the car with the sealant holding it gently in place. We put the guide bolts into a few holes under the car (once the pan is in place we will remove these and add the real bolts). We added a nice bead of gasket sealant to the rim of the oil pan. Here is where you need multiple people…. We fit the oil pump into the engine from the underside and Scott held the dowel holding it in place. Len passed me the oil pan (I was under the car). Len and I guided the pan into place using the guide bolts and without disturbing the gasket. I then held the pan in place while Len added a few of the real bolts to hold it up which enabled Scott to remove the dowel (as the oil pump is supported by the spring in we put in the pan). While I was holding the pan from tilting, Scott and Len hand tighten a bunch of the bolts. I was then able to let go of the pan and help with the bolts. Now, there is also some controversy here. I used gasket sealant. Some people don’t use it. I did. Some people also only hand tighten the pan, other people use a torque wrench to 30 lbs or 20 lbs. Other people insist 6 lbs is the max to use. I hand tightened the bolts using a ratchet set to where it felt tight. We aren’t done yet. We added the side panels on (they each 2 bolts with the engine pan on either side). We later realized that we had to remove these panels to attach the flywheel housing inspection plate (the watermelon slice piece). You apparently need this inspection panel off to install the oil pan; however, need to put it back before you install the side panels. Sequence can be everything. At this point it was noon and Len had a baseball game. I owe Len big time for his expertise. We still aren’t done. It was now time to paint some oil in the valve chamber. So you know, if you start dumping oil in the valve chamber, much will get on the ground. Trust me. It spills over the side, reaches the side panels and then leaks everywhere. Aside from this mess, the installation of the valve cover went well as well. I had to head across the street and find Scott – as I no longer had guide bolts (they left with len) and needed an extra pair of hands. A little sealant on the block, a little on the gasket, and then two people putting it onto the car and tightening it up. Again, how tight seems controversial. I hand tightened with a wrench. Do I go and now start the car? NO! It takes 24 hours for the silicon to set and I have to get back to the city and prepare for a Monday AM meeting. Next weekend I have to reattach the choke rod, inspect the bolts, tighten the oil plug, add 4.5 to 5 quarts of oil, get the car off of the jack stands, hand turn the crank a few times and wait a while (to get the oil splashed around a little and allow it to trickle about within the engine), and then I can see if all this effort worked or if I am leaking oil out of the seals or left a screwdriver in the valve chamber (I didn’t). 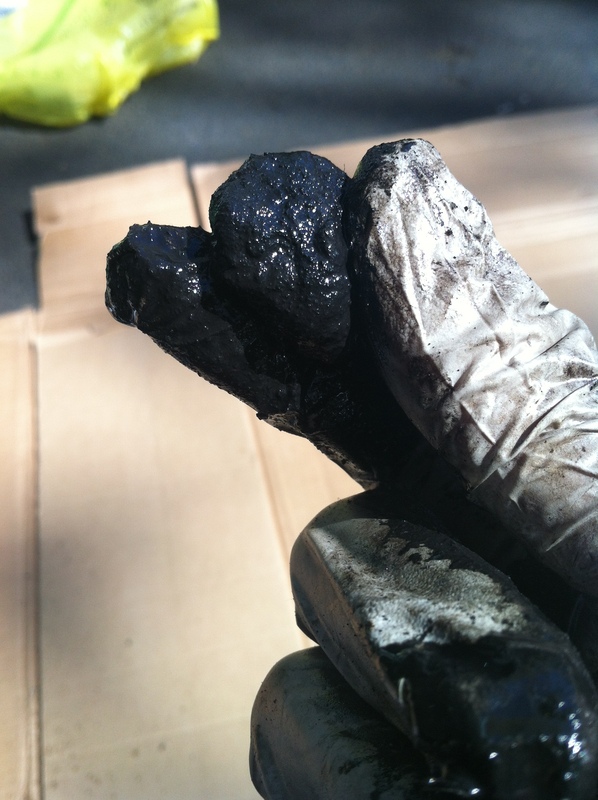 If the oil does still leak, at least it is clean oil and not the gunk we saw in it when we started. That alone is reason enough to have done all this work. I Can’t Bear It Any More! 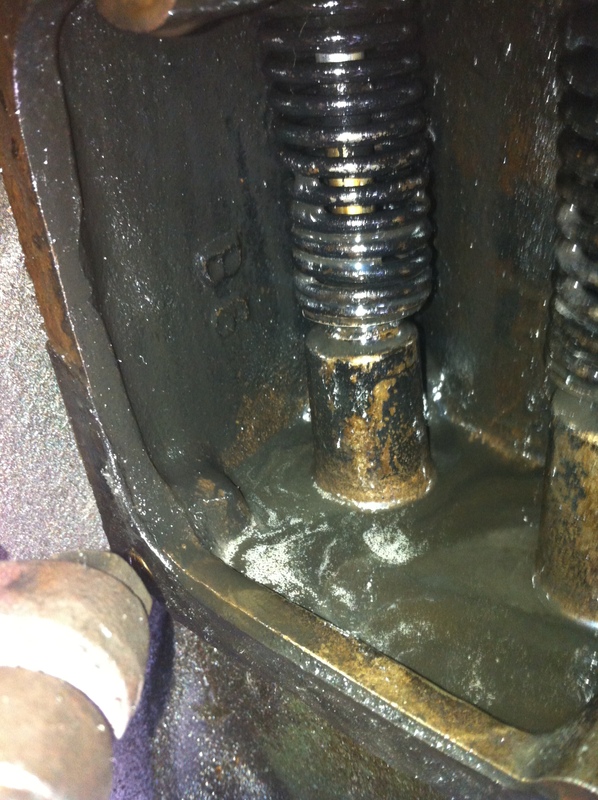 I blogged about the valve chamber and gunk yesterday. To clean the valve chamber you need to make certain that any gunk doesn’t head down the oil passageways (narrow holes). To do this properly, you try to find the holes, plug them up with something that won’t get stuck, clean the chamber, remove the plugs in the holes, and then clean the oil passageways which should readily drip fluid through to the other end. Knowing the location of the holes helps if they are hidden by or blocked with gunk. I started looking for these holes at 9AM. The valve chamber has three areas. I was told to make certain to plug the two small holes in the front area, the one mid-size hole in the center area, and the two small holes in the back area. This is where it gets fun. Evidently not all Model A engines are alike. 2 hours after I started (and with the help of a neighbor) we found one hole in the back area. Apparently the early 1929s didn’t all have two holes in this chamber. If it wasn’t for Scott Hanson (the neighbor across the street), I wouldn’t even believe that this one existed. Here is a shot of him and me in a matching pair of fashionable coveralls. When challenged with working on a car, Scott insists on wearing all white. To make certain that the passageways are clean, I decided that if I sprayed WD40 (spray oil) into the passageways, the WD40 would flow readily and a stream of it would hit the ground. So, I put cardboard under the car and unloaded a lot of WD40 into the passageways ……. NOTHING! This is bad and sent me into a panic (with posting to Fordbarn and calls out to mechanics). One person told me the WD40 should flow free, another said I needed to blow air through the system (BTW, a small straw does fit into some of the channels and can be used to blow air). Still, nothing. The neighbor suggested break out carburetor cleaner. Apparently, carb cleaner flows better than WD40. From under the car I hear “its dripping”. I should mention that the day has now passed and it was about 2:30PM. We wiped things up and then went out for beers, chili, and ribs. 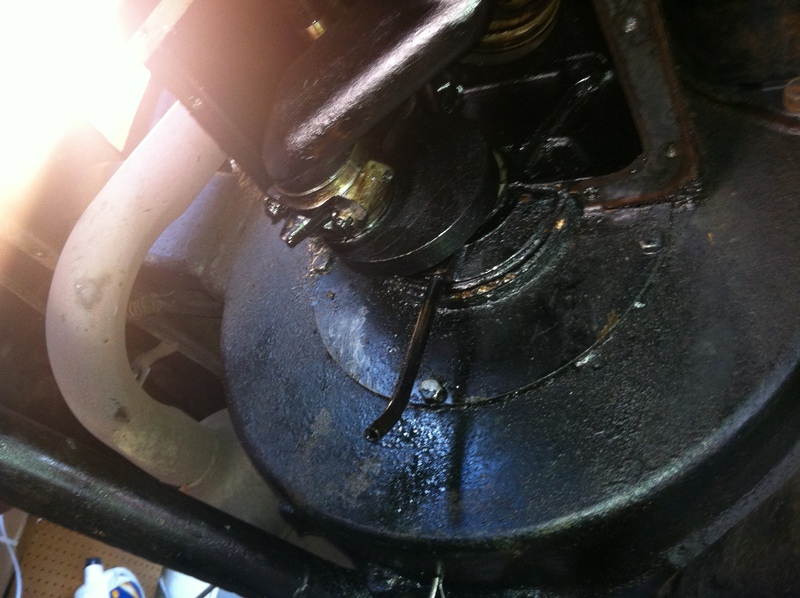 At about 4:30 we returned with more carb cleaner, PB Blaster, black enamel engine paint, and some other supplies. Scott also insisted that we use his jack stands, which are about a foot taller than the ones we were previously using. At about 6:00 we moved from cleaning on to checking bearing clearances. For those whom aren’t car-savvy, there are some things you need to know. Let’s start with bearings and clearances. A “bearing” is something that helps support/direct/constrain movement. Loosely grab your left wrist with your right hand. Now twist your left hand like you are turning a door knob. If your hold too tight with your right hand, you can’t move your left wrist. If you hold too loose, you can flap your left arm around and its motion isn’t really being constrained to the door knob. Your right hand holding the wrist like this is the “bearing”. How tight or lose your grip is using your right hand is your “bearing clearance”. You are now an expert on bearings and clearances. In my situation, the bearing is effectively metal rings (your right hand and a few more hands) that hold a metal stick in place when it spins. The stick is held tight enough not to bang around haphazardly but lose enough to allow oil to get between the ring and the stick allowing it to spin. Multiple bearings (hands) hold the stick in place. With the car, this metal stick has a bunch of funny zig-zag bends in it and is called a crank. The “main bearings” hold the crank in the engine. There are three of these main bearings. One in the front, one in the center, on in the rear. Attached to some of the zig-zag bends in the crank is another bearing that connects the crank to a metal arm that is connected to the pistons. The pistons move up and down in the engine. As the pistons are forced to move (because of the small explosions in the engine) they turn the crank. This metal arm is called a “rod”. The bearing that connect the rod to the crank are “rod bearings”. There are four of these in my car. If you can’t follow this mentally, that is ok. My description isn’t great. 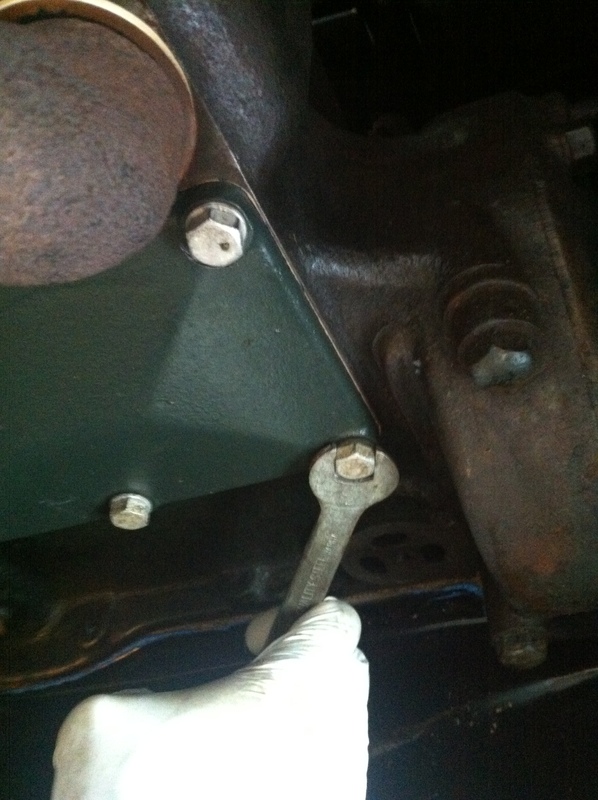 With the oil pan off, there is a way to “check bearing clearances” to make certain that there is no excess movement and that the grip isn’t too loose or tight. Checking clearances every 10,000 miles or so is a great idea in old cars. Some folks do it every 2,500 miles. I suspect it hasn’t been done in my car for 40+ years. All this prep! All this learning! All this work! All this anxiety! So, what happened? Let’s go back to the hand/wrist thing. Let’s say you want to measure your clearance. If you take a small piece of clay in the palm of your right hand and then grip your left hand like you did before, the clay would squish. If you figure out how much the clay squished, you would know how “loose” the grip was around your wrist. You can do this with the bearings in a Model A. The rings that hold the rods in place are made of a top and bottom that are bolted together. You can open the grip by taking these pieces apart. You just need to open the grip, insert a piece of plastigage, and then retighten it. Plastigage is a wax material that squishes. Once it is squished you again open the grip, measure the squish, and adjust the clearance by adding or removing “shims”. It sounds really easy and simple, right? It shouldn’t take long, right? I decided that I wasn’t going to do all the main bearing and would do the rod bearings. Scott and I started at the front rod bearing. We were able to remove the nuts on the bolts but unable to get the two pieces apart and open the grip. If you can’t get them apart, you can’t do what needs to be done to measure the clearance. I know that “when the oil pan is down, you should check the clearance”. This is an old engine. Everything looked fine. As of this evening (9PM), I am thinking that I should probably not go looking for problems. At some point over the next few years I am certain I will drop the pan again or get the engine overhauled. It is an old engine and needs a refresh. At that time I will likely have a specialized shop (J&M or somewhere like that) do the job right. As for now, I can’t bear the thought of not driving the car for yet another beautiful weekend. The plans, as of 10:30PM are to get some sleep and wake early tomorrow to work on the car. One of the local Model A club guys is scheduled to come over at 9AM and help me raise the pan back. I still have a few pieces that I wanted to clean and paint before this happens. I guess they too may have to wait.